I love T.G.I.Fridays! And I'm going to love them more for they are bringing in more and more flavors for us! 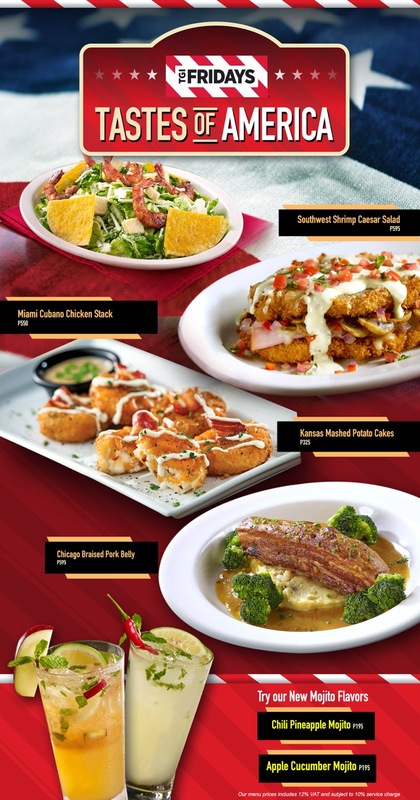 Celebration at T.G.I.Friday’s starts as they bring us the tastes of America! Laid out with amazing flavors we all loved, Tastes of America is surely the way to capture our patriotic Filipino hearts. Start off your meal with the scrumptious Southwest Shrimp Salad made from the freshest ingredients to ensure that yummy crunch in every bite. Next, taste the sunny flavors of Florida with the Miami Cubano Chicken Stack followed by Kansas Mashed Potato and you’ll definitely see the yellow brick road to paradise. You can also have the juicy crowd favorite Chicago Braised Pork Belly and get some of that real Chicago flair in your mouth. Top off your dish of choice with either Chili Pineapple or Apple Cucumber mojito and you’ll feel like its Friday on any day of the week. Whatever your choice is, T.G.I.Friday’s will make sure that you’ll get a taste of America in every bite.